The final Budget before the UK leaves the EU has been delivered by Chancellor Philip Hammond – preparing the country for what he says is a “new chapter” for the economy. Lots of measures that will affect the money in your pocket have been announced in the speech which lasted for well over an hour. Here is what it means for you. A total of 31 million people pay income tax in the UK: 18 million men and 13 million women. Some 25.6 million of these taxpayers pay income tax at the basic rate. The amount you can earn each year before this basic rate of income tax is paid – called the personal allowance – stands at £11,850 at the moment. In April, a year earlier than expected, this will change so the first £12,500 of earnings will be free from income tax. The higher rate of tax, which starts to be paid at £46,350 at the moment, will start at £50,000 in April, also 12 months earlier than was pledged. This will be a boost to the take-home pay of millions of people. Accountants Deloitte said this would mean an annual tax saving of £130 for basic rate taxpayers, £860 for higher rate taxpayers and £600 for additional rate taxpayers. This will cost of £2.8bn in the next financial year to the Treasury. These levels will be frozen the following year, but significantly will rise in line with inflation thereafter. That means, as people earn more, they will not automatically be dragged into a higher tax band. The way income tax is levied is different in Scotland, owing to its devolved powers. At the moment. the starter rate also begins when annual earnings reach £11,850, while the higher rate starts at £43,430. Any changes will be announced in the Scottish Budget in December. What about benefits? Hasn’t Universal Credit proved controversial? Yes, there has been quite a debate within the Conservative Party about how this is being introduced. Universal Credit is a single monthly payment for people on a low income or who are out of work. It replaces some of the benefits and tax credits that are seen today, such as housing benefit and Jobseeker’s Allowance. This is a hugely complex welfare reform, potentially affecting millions of people in different ways in the future – with winners and losers. Various transition measures will be introduced over the next five years, but no details have been released as yet. However, the chancellor said that work allowances would be increased when the roll out of Universal Credit is complete. The allowance is the amount somebody can earn before their benefit payment is affected. In the July 2015 Budget, George Osborne cut the work allowances in Universal Credit. Is there a pay rise for anyone? The level of the National Living Wage, currently £7.83 an hour, will rise by more than the cost of living. So the National Living Wage, which is for workers aged 25 and over, will rise to £8.21 an hour in April. Will drivers like this Budget? Prime Minister Theresa May had already announced that fuel duty would be frozen for the ninth year in a row. As announced during the weekend, local councils in England will receive an extra £420m to tackle a growing number of potholes. Campaigners say this is not enough to solve the problem. As at the last Budget, the duty on beer, cider, and spirits has been frozen, although there will be an increase on some high-strength drinks, including some white ciders. Wine duty will rise in line with inflation. In a move welcomed by many debt charities, the government is extending the breathing space from legal action given to those facing repayment difficulties, from six weeks to 60 days. A no-interest loan scheme for the financially stretched to overcome vital and unexpected household costs will also be investigated, similar to the Good Shepherd project seen in Australia. A study will take place next year, working out how a pilot scheme might work. So, it could be sometime before this became a mainstream option. Any change for the self-employed? 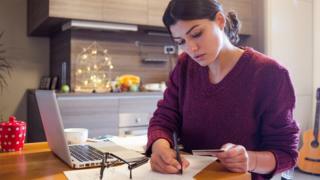 The Treasury believes a third of people claiming self-employed status as a “personal service company” are actually working in the same way as employees and should pay more income tax and national insurance. Having changed the rules on this in the public sector, it will now do the same in the private sector from April 2020. However, this will only be used for those working for large and medium-sized businesses. Campaigners immediately described it as a “fresh raid” on the self-employed. First-time buyers in England who buy a shared ownership home will no longer have to pay stamp duty for homes of up to £500,000, matching the commitment for the majority of first-time buyers made in the last Budget. This will also be backdated for anyone who has bought such a property in the last year. There are more than 200,000 shared ownership properties in the UK. What about actual notes and coins? A commemorative 50p coin will be issued to mark the UK’s departure from the EU. The coin will feature the Queen’s head and the date 29 March 2019 and on the reverse the phrase “Friendship with all nations”. This is a bit of a turnaround from the last Budget, when the Treasury paved the way for the withdrawal of 1p and 2p coins, and possibly the £50 note. This idea has since been dropped. Some changes to the way higher redundancy payments, company cars, and employee loans are taxed will also take effect in April.